When a chocolate craving hits, it’s not something you can easily ignore. Your appetite simply won’t be satisfied until you’ve eaten some kind of chocolate dessert. But if a candy bar or a simple chocolate cake recipe just won’t hit the spot, the good news is that we’ve got some yummy and surprisingly simple Mexican chocolate dessert recipes for you to try! What’s better than a mug of hot chocolate, especially on a chilly night? This Mexican hot chocolate recipe will leave you wondering why you ever bought pre-packaged hot cocoa. With some simple ingredients, such as milk, cocoa powder, and chile powder, you can create a delicious and creamy mug of hot cocoa in no time. It’s as easy as combining the ingredients into a saucepan over medium heat until simmering. You can even add cornstarch for added thickness, if desired. Think the only way to get churros is to head out to your local Macayo’s location or wait for a fair to roll into town? Think again! 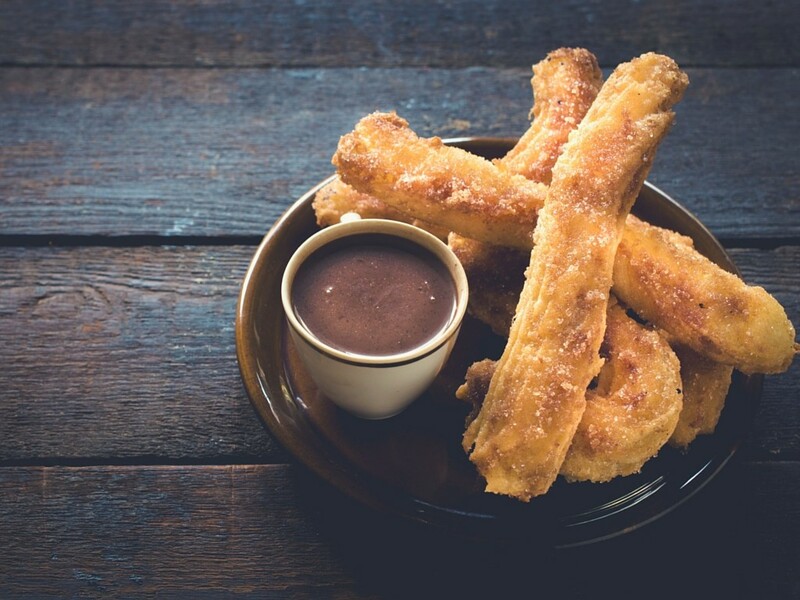 With a little bit of sugar, flour, vegetable oil, and cinnamon, you can make your very own crispy and delicious churros at home. This particular recipe features churros paired with a delectable chocolate peppermint syrup that’s made with a little sugar, cocoa powder, corn syrup, chocolate chips, and peppermint extract. Perfect for dipping or drizzling! Love chocolate cake? Love Guinness beer? This recipe allows you to enjoy the best of both worlds with a sampling of both flavors! This bundt chocolate Guinness cake is perfect for serving up at your next gathering and is sure to be a crowd-pleaser. A small amount of Mexican chocolate and a cup of Guinness go a long way in developing the unique and delicious flavors of this recipe. With a bit of whipping cream, cream cheese, and powdered sugar, you can even create a homemade frosting to top this cake off and really wow your guests. Even if you’ve had salted caramels in the past, you simply haven’t lived until you’ve enjoyed Mexican chocolate salted caramels. Trust us on this one! But wait; there’s no reason to rush out to your local Mexican grocery store to grab some of these for yourself. You might already have the basic ingredients on-hand to make these in the comfort of your own home. With a mixture of bittersweet and Mexican chocolate, dried red chiles, sugar, and heavy cream, you’ll be well on your way to creating these little squares of deliciousness. Just be sure to make these for a crowd; otherwise, you might find yourself finishing off an entire dish in one night. They’re that good. These are just a few ideas for Mexican chocolate desserts to try out for yourself the next time you’re in the mood for something sweet with a little bit of a kick! From simple hot chocolate to salted Mexican chocolate chile caramels and everything in between, you really can’t go wrong with any of these unique and easy recipes.